Never been too crazy about meatloaf: it's tasty enough. That's changed now that I've found this recipe with this sauce to go on top. The sauce is rich (a blond roux), spicy, flavorful. Via Paul Prudhomme, the grandmaster of Louisiana cooking. 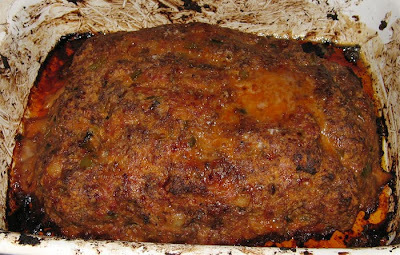 I have been making this meatloaf recipe ever since my first trip to New Orleans well over 20 years ago.Ate at Paul Prudhomme's restaurant, K Paul's; he was eating at the next table. Everyone who has ever eaten this at my home has asked for the recipe. Now I reduce the calories by using about half ground turkey and half ground beef, low fat evaporated milk and less butter, but it doesn't affect the outcome at all.